You might be asking yourself "What EMF?". The answer is all around you and through you even if you cannot feel it directly. If you use a cell phone or a WiFi device you are constantly being radiated by the energy of these electromagnetic fields. 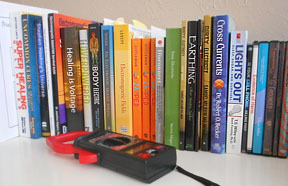 A more thorough description of the phenomenon and it's dangers is included on the following information pages of our website: "Healthy Home Guide", EMF Free Bedroom, and in recommended books . Below you see our client "top picks" - the most popular personal EMF Safety products -- for protection from the harmful effects of EMF. What EMF you ask? Reveal EMF with the Two Meters that measure the Most Common Types of EMF Exposure found in today's environments. 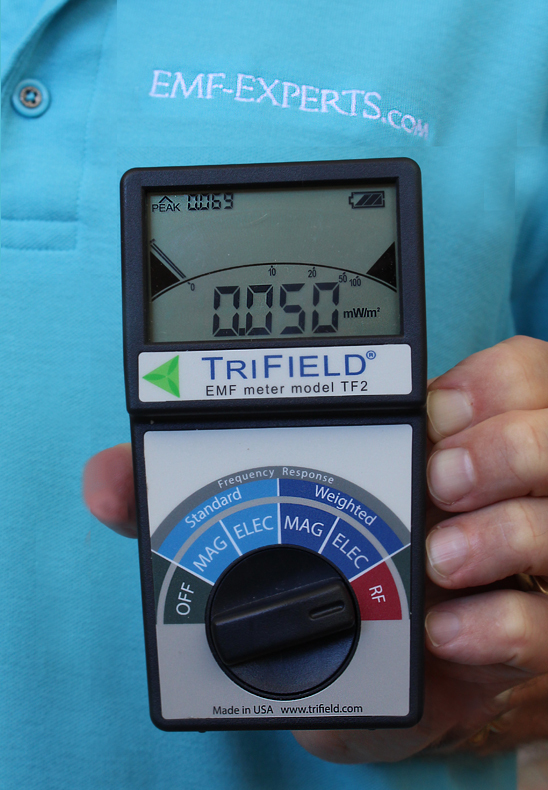 The TriField EMF Meter is an AC gaussmeter, AC electric field meter, and radio power density meter in a single unit, that combines all the features needed for fast, accurate measurements of electromagnetic fields (EMF). In addition to standard AC measurement modes, a special frequency weighted mode will scale the magnetic and electric measurements to emphasize and adjust the magnitude of readings to suggest potentially higher impact by each type of field inside the human body. This calibrated wideband (800 MHz – 2.5 GHz) radio/microwave meter allows a choice of peak or average (RMS) indication mode or peak mode. This permits accurate measurement of both digital (intermittent) and analog (continuous) signals. Two ranges: 1 - 1999 µW/m² (same as 0.1 – 199.9 nW/cm²) and 0.1 - 199.9 µW/m² (same as 0.01 – 19.99 nW/cm²). Find out what EMF can be heard in your environment with audio tones allow you to identify what EMF power density is present – none, or intensity proportional to field strength, or proportional to frequency (for analyzing pulsed signals). Accuracy ±6 dB . The true logarithmic - periodic antenna measurs 800 MHz – 2.5 GHz, signal polarized. The display on the HF35C updates every ½ second to show what EMF is detectable. The fastest pulse it can detect is 0.5 micro seconds. When in peak mode, the display averages all peaks within ½ of a second. The average peak is displayed on the display. In RMS mode it displays the RMS average of all signals during that ½ second period. Easily measures fields in the ranges identified by Building Biology testing methods guidelines (SBM-2008) as being of concern in sleeping environments. This is a directional meter that easily detects the direction of cell phone towers, cordless phones even through walls. . Instructions in many languages. 2 year Warranty. This meter is not intended for professional industry-grade investigations, however it will detect the level of RF fields which have been defined in the Building Biology testing methods guidelines (SBM-2008) as being of concern in frequented environments. Need a good night's sleep? This is the solution for you. 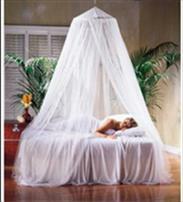 Easy to install, this fully assembled bed canopy can be hung from the ceiling or any 4 post bed frame. Made from high quality Swiss shield fabric, The canopy offers a nearly transparent netting similar to mosquito netting which is washable and pleasing to the eye while delivering a 97% reduction in EMF energy penetration. This fabric is also available by the linear foot if you prefer to hang it on a bedframe. The fabric cost is only slightly less than the ready made hanging canopy. Please refer to the order page for more info: Fabric by the foot. Enjoy a peaceful night’s rest under reduced exposure to RF radiation such as celltowers, WiFi, and mobile phone signals! 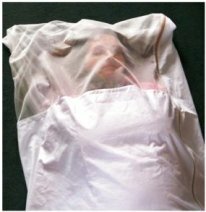 Bloc Bag is a protective sleeping bag made from comfortable, light weight, microwave reflecting material… superb "Swiss Shield Wear" cotton shielding fabric is used for the body, and "Swiss Shield Daylite" polyester mesh fabric for the hood. Pretty, white fabric feels almost like cotton bed sheet and folds nicely to the size of a book for complete portability. Great for home or travel. Tested to provide 22dB attenuation up to 1.8 GHz, no grounding necessary. Extensive zipper for easy in/out and ample 96x34 inch space is plenty of room for the average adult. Wash in cold (40°C) water with gentle cycle using mild detergent only! Spend the whole night or enjoy a completely new kind of power nap! 96x34 inches overall, with a 32x34 inch "window" at one end. This Cell Phone Shield will transform your current phone carrying case into an Industry leading Microwave Shielded EMF protection case by adding this bonded composite high performance shield insert. This insert can be used with any type of cellphone in any type of cellphone case. Read our firsthand review of this inexpensive, simple, clever, 99.9%-effective cellphone radiation shielding product. 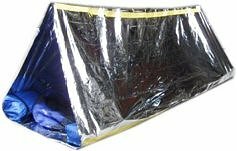 "A Portable RF Haven for Those with ES"
This tent, made from aluminized Mylar (well known for its good RF shielding ability, toughness, and light weight) is so handy, versatile, and effective you won’t want to travel without one. It is basically a tube, 8 feet long, with a perimeter of 10 feet, and open at both ends. Use it the way it comes as a Faraday sleeping bag or tent (tent will need some structural support which is not included, such as rope, stakes, tape, and so on). Or slit it open to a giant 8x10 foot sheet which is big enough for a king size bed blanket, ground cover, personal wrap, or window curtain. Trim it with scissors to make a poncho, skirt, or smaller enclosures for wifi modems, etc. EMF SmartWear is our own line of eco-friendly apparel for stylish everyday protection from environmental EMF. 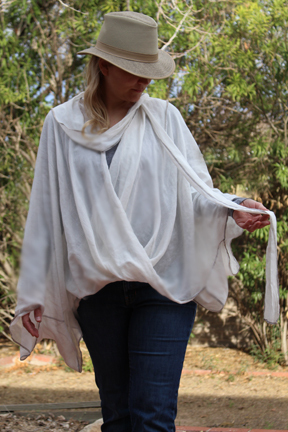 The Poncho, Valero (pictured here), and Hooded Scarves are all casual easy care, wear-with-anything, go-anywhere protection. But it is the the ultra versatile Multi-Wrap that is the hands-down, go-to favorite, since it cleverly designed to be worn multiple ways for any occasion - a wrap around shawl for evenings at the opera, a long vest with jeans and boots the next morning, and four other different stylish looks. SmartWear also offers skin friendly, soft organic cotton, under shirts, or "Under Shields", designed to provide high level EMF (RF) protection for your inner core organs, without being seen under everyday clothing, in sizes for every member of the family. What EMF? Indeed. Click here for more information, photos, styles: "EMF SmartWear"